For the past years, thanks to the direct leadership and direction of the Central Military Commission (CMC) and the Ministry of National Defense (MND), and the special effort of the force, the Vietnam Coast Guard (VCG) has always accomplished its mission successfully, hence maintaining a peaceful, cooperative and friendly environment in the East Sea, contributing to firmly protecting the sovereignty, sovereign right, jurisdiction, national security, safety and order in the country’s waters and islands. The above mentioned achievements can be attributed, firstly, to the comprehensive and synchronous implementation of the VCG’s Party Committee and High Command of the guidelines and measures on building the force towards “revolutionary, regular, seasoned, modern, and highly professional” direction with a suitable law enforcement capability. In 2017, through its professional activities, VCG discovered, settled and expelled thousands of foreign boats and ships from Vietnam’s waters; captured hundreds of ships which were found guilty of smuggling and trade frauds; in coordination with the Public Security force directly cracked 150 drug cases. At present, the mission of protecting sovereignty and territorial territory of the country is posing new contents and requirements with many latent complications. Against this backdrop, the mission of VCG sees new developments with both difficulties and complications which requires the force to grasp and solve the problems effectively by legal measures in a peaceful and humanitarian manner in sea. Accordingly, VCG should continue to thoroughly grasp the Party’s guidelines and viewpoints, the state’s policies and laws, and directly the leadership and direction of the CMC and the MND; while focusing on the enhancement of its overall quality, combat strength and law enforcement capability via the following measures. 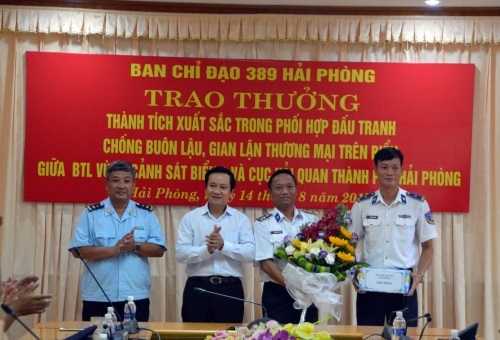 First, being proactive in studying and active in giving advice on the building and perfection of the legal system; focusing on fulfilling its core role in studying, building and proposing to the authorised levels the issue of Vietnam’s Coast Guard Law to lay a synchronous and adequate legal foundation for the force to carry out its tasks successfully. As shown in reality, after 20 years of enforcement, the Vietnam’s Coast Guard Order (issued in 1998 and amended in 2008) has exposed some shortcomings and limitations. In the mean time, the development of Vietnam Coast Guard in response to the mission of Fatherland construction and defence in the era of industrialization, modernization and international integration is posing new problems needed to be solved. Therefore, Vietnam Coast Guard should grasp and thoroughly implement the resolutions and directions of the upper authorities on building and perfecting the legal system regarding seas and islands as well as defence and security potential and posture; study, coordinate, advise and propose to the CMC and the Minister of National Defence the making and perfection of the Vietnam Coast Guard Draft Law and submit to the Government for approval in the 6th session of the 14th National Assembly which is scheduled to take place in October 2018. This is necessary for the institutionalisation of the Party’s lines, the Constitution and the law of the State; for the efficacy of the protection and management of the sovereignty, security, safety and order at sea, contributing to enhancing the law enforcement capability of VCG in the new situation. Second, stepping up legal dissemination and education for people, especially fishermen in coastal areas. Emphasis should be placed on the resolutions, directions of upper echelons and the Party Committee and High Command of the VCG on legal dissemination and education; on authority and responsibilities of VCG, each unit and each individual; on legal documents relating to professional practices; on regulations of authorised agencies on the relation and interaction with foreigners; on guidelines and rules in dealing with situations in the course of law enforcement on sea. Third, effectively implementing the Project of building Vietnam Coast Guard until 2020 and beyond, which was approved by the Prime Minister. This implementation is aimed to: make the force revolutionary, regular, seasoned, modern and highly professional; reasonably structured, compact, synchronously equipped, meeting the requirements of protection of the sovereignty, sovereign right, jurisdiction, and law enforcement on the sea, enhancing the effectiveness of international cooperation. Attention should be paid to making the staff politically steadfast, morally good, highly qualified, and capable of mastering and exploiting modern weapons and equipment in order to meet the mission requirements in any situation. Fourth, cooperating closely with friendly forces and localities, firstly coastal localities, the Navy, the Border Guard, the Public Security, Customs, Fishery Surveillance during the course of law enforcement. This coordination should be carried out in waters stretching from baseline to the outer boundary of the exclusive economic zone, continental shelf of Vietnam, within internal waters, and at seaports. During the course of coordination, it is necessary to stick to characteristics, functions, missions and the requirements for each force; strictly obey the State law; conform with international practices, regulations and rules for coordination to ensure efficacy and effectiveness and promote the synergy in protecting and maintaining the sovereignty, sovereign right, jurisdiction, security, order, and the peaceful, friendly, and cooperative environment in Vietnam’s seas. In addition, it is necessary to attach importance to improving the quality of external affairs of VCG. Party committees and commanders at all levels should grasp and stick to the viewpoints, guidelines, strategies, policies on foreign affairs, international cooperation and defense diplomacy of the Party and State, directly the CMC and MND; proactively study and give advice to upper levels; directly sign programs and plans on defence cooperation and diplomacy, and sustain the effectiveness of these programs; set up hotlines with law enforcers of the countries bordering Vietnam in sea and other countries in the world, such as America, Japan, India, etc, for coordination in settling problems when necessary. Effectively implementing the above mentioned measures will necessarily make Vietnam Coast Guard “revolutionary, regular, seasoned, modern”, highly capable of law enforcement, creating a peaceful, stable, cooperative, and friendly environment with regional countries, contributing to firmly protecting the sovereignty, sovereign right, and jurisdiction in sacred seas of the country.